Last week, I had lunch with my long-time friend and life insurance agent, Jon. Years ago, I set up a term life insurance policy with Jon when he was just getting started in the business. I knew that I wanted to protect my family’s financial future if something were to happen to me. And of course it made me happy to give Jon my business and help him generate some commissions. But over lunch last week, Jon tried to talk me into making a huge financial mistake. Fortunately, I knew enough to sidestep the recommendation. But it made me angry to think that so many retirees — or future retirees — fall for this common pitfall. The concept behind life insurance is pretty simple: You pay an insurance company a monthly premium for a specified number of years. And if you pass away during this time, the insurance company pays a lump sum to your loved ones. This type of “term” policy is extremely valuable for people like me — with a young family that counts on me to earn the money to cover day-to-day expenses. And for most individuals, this type of policy is fairly inexpensive. For about the same cost as my monthly water bill, my family can receive a couple million dollars to help with if expenses if I’m not around to take care of them. Perhaps you are in a similar situation with loved ones that count on you for income or to provide care for kids or other family members. 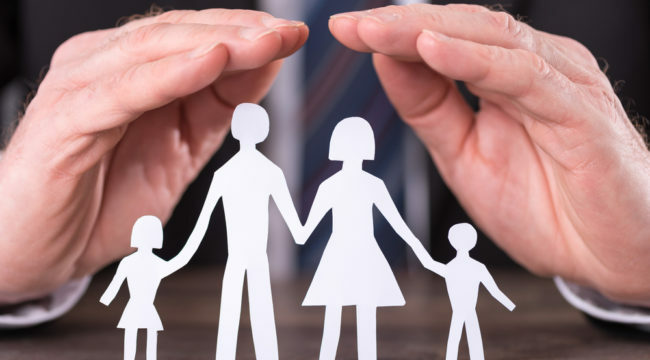 Unfortunately, while the basic concept behind life insurance is easy to understand, the life insurance industry has added nuances to these products that can make buying life insurance much more complicated. A different type of life insurance that agents are aggressively selling is often referred to as “whole” life insurance. Incidentally, this is the type of insurance that my friend Jon was trying to sell me. At its core, “whole” life insurance is similar to the “term” policy that I just showed you. For one thing, whole life insurance policies typically have no expiration date. So if you buy a whole life insurance policy, it doesn’t matter if you die early, or if you die at a ripe old age. Either way, the policy will pay a sum of money to your beneficiaries. Second, most whole life insurance plans have a “cash value” component. The way this works, is that you pay extra to the insurance company and they accumulate that extra cash as part of your ultimate payout. Over time, that cash value is guaranteed to grow at a specific rate. And for some policies, the cash value can be used to pay for future monthly premiums. 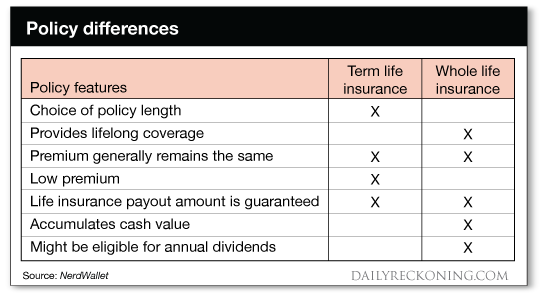 Here’s a quick table I came across recently that explains the differences between term and whole life insurance. While both of the whole life insurance features actually sound appealing (who wouldn’t want an insurance contract that never expires — or a cash value that continually increases), the real trick is in how much an insurance company charges for these added features. Usually, that meant it was time to do the dishes or some other chore. But what my mom was really trying to teach us is that there is always a catch when it appears you’re getting an extra benefit. Whole life insurance policies are sold by insurance companies, because they make so much sense… for the insurance companies! You see, when you pay extra for a whole life insurance policy, the insurance company takes the extra money and it invests that cash. Over time, the value of this extra cash grows and grows. And some of that cash goes to you as the policyholder. But the reason whole life insurance companies push these whole life insurance policies so aggressively is because they are so profitable. These insurance companies employ armies of statisticians who crunch the numbers on everything from how long you’re likely to live, to how much money they can make on your money before they have to pay you. And the end result is that insurance companies make much more by charging you extra for whole life insurance, than they will ultimately pay your heirs when you pass away. Now I don’t want to discourage you from buying life insurance for your loved ones. Especially if you’re still in a life period where people are counting on you to provide for them. But I’d rather see you protect your family AND build your wealth at the same time. That’s why I strongly encourage you to politely say “no thanks” when your insurance agent or financial planner tries to sell you whole life insurance, and take a more effective strategy. Instead of paying extra for a whole life insurance policy, buy a term policy that covers the amount of time that people will be relying on you for needed income. In my case, that’s about another 15 years until my youngest moves out of the house. Once you’ve purchased your cheaper term life insurance policy, take the extra money that you would have spent on a whole life policy, and start investing in solid dividend-paying stocks. The kind of stocks that I feature regularly in my Lifetime Income Report service. You’ll find that over time, the wealth you accumulate from saving money on your life insurance premiums — and investing those savings for yourself instead of letting the insurance company invest for its own gain — will go much farther in growing your wealth. And best of all, you can decide exactly when and how to pass that wealth on to your loved ones. Instead of waiting for a life insurance policy to pay out when you’re no longer around. So please do yourself and your heirs a favor. Avoid the whole life insurance scam and take charge of your own investments. You’ll be much better off and grow your wealth much more quickly that way. P.S. If you would like more help in picking out specific dividend stocks that can best build your wealth, check out my Lifetime Income Report dividend stock presentation. This newsletters gives you access to the best dividend stocks in today’s market and keeps you up to date on new opportunities to grow your income. I'm a Terrible Landlord… But Even I Can Make Money in Today’s Real Estate Market!